Better pricing doesn’t always have to be dropping your prices instantly. It’s somehow psychological in nature. There’s a subtle art to make it appear that you’re offering a better price without sacrificing your bottom-line. This is where presenting offers, discounts, and deals will help your online store achieve your revenue goals. In fact, 96% of consumers use coupons and 92% of consumers always look for a deal when shopping. As a general rule, most customers are attracted to buy a product if they see more value in it. Now, we’ll look at some of the most popular ways you can use discounts to drive customer loyalty and conversions and, of course, how to most effectively use them. A direct price-off incentive that an eCommerce store offers to a shopper in return for a purchase made, e.g. “Apply $5 Discount”. A price-off incentive can appear as a direct cash discount or with the use of a coupon code. E-commerce stores often use cash discounts to take advantage of the principle of urgency, as these cash discounts are most of the time only available for a limited time. If shoppers won’t purchase the item now at a discounted price, chances are they’ll miss out saving money when they purchase at a later time. A percentage-based incentive works the same as a cash discount/coupon, except that you are offering the incentive with a percentage reduction of the item’s value, e.g. “Apply 5% Discount”. The same principle of urgency applies, however, the effectiveness now becomes relative because of the customer’s perception. Free shipping is the number one option why shoppers checkout online. It even motivates shoppers to take an action just to qualify for free shipping. Just like 48% of shoppers add more items to their carts to qualify for free shipping and 41% of shoppers even search online for a free shipping promo code. Without discounting your product’s price, you can offer your shoppers with a value-added item, e.g. free gift, in exchange for their purchase. Most of the value-added offers can be complementary items or you can use your slow-moving inventories as a free item or offer a free service. When it comes to applying offers, coupons, discounts, and deals you have limitless options. But, let’s explore some of the best practices in the eCommerce industry today coupled with the most creative ways and examples to use them to drive your online revenue and influence customer loyalty. Email seems a bit traditional but email marketing is still one of the most cost-effective marketing strategies with enormous ROI of $38 for every $1 spent. This means that growing your email subscribers list is a good investment for every dollar you spend on marketing. By getting your shoppers’ email addresses, you have the avenue to build a relationship, drive sales, and foster customer loyalty in the future. 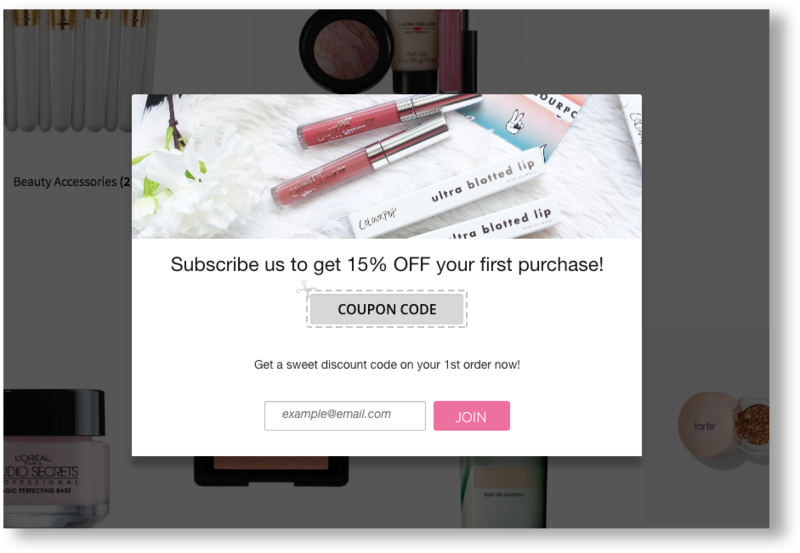 You can entice your visitors to join your email subscription or newsletter by placing an email opt-in form together with a discount offer as an incentive. For instance, this is an email opt-in form created by Better Coupon Box. You can offer a discount coupon for 5-15% off the shopper’s first purchase in exchange for his email address. 91% of consumers reported that they are a member of a member-exclusive loyalty program. They said they entered into a loyalty program because of member-only discounts or offers. There’s a willingness from customers to be part of an online store’s membership program because of the perceived exclusivity and access to rewards and deals. An example of this is Target’s REDCard is a customer loyalty program which rewards its shoppers with additional 5% discount every time they shop. REDCard members also get early access to rewards and upcoming deals and discounts. Gamification is a fun and engaging activity that you can apply to your offers and deals. The element of surprise and entertainment will help attract your shoppers to participate. Gamification amplifies your customer engagement and helps you foster a positive customer experience. And a satisfied customer means a customer who comes back to your online store and makes repeat purchases. A perfect example is the “Play! By Sephora”. The game mechanics are simple. 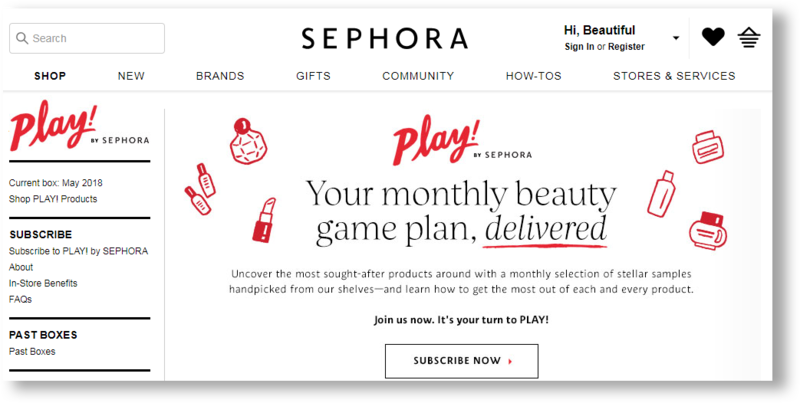 Each month Sephora curates a whole new selection of their latest and best-selling products and then creates a game incorporating these products. The winners will receive free trials of the game’s featured products plus Sephora bonus points that they can use for their next purchase. Try gamification feature from Checkout Boost. This feature allows you to show offers only to customers whose order value reaches a goal amount. A heading bar will show up to encourage customers to spend a little more in order to receive a sweet offer. It’s a win-win offer that both you and your customers will definitely love! Product bundling is a type of upsell and cross-sell strategy that entices shoppers to order more items and enjoy the benefit of a bundled pricing. Product bundling works because shoppers will perceive that they will save more money by buying two or more items together rather than purchasing them individually. It’s also one of the most used strategies to increase a customer’s average order value. Let’s take for example BaubleBar’s “Positive Vibes Special Pack!” product bundle which allows customers to select 3 bracelets for a lower bundled price. The tool they’re using to create product bundles is Boost Sales. Influencer marketing has grown exponentially over the years because it generates 37% higher customer retention rate compared to other acquisition channels. To expand your reach and help you drive revenue, collaborate with influencers. Find the influencers that match your brand ideals and goals and then check their authority, reputation, and engagement. What you can do is to provide your selected influencers with an exclusive discount code that they can share with their followers. Depending on your budget, you can ask these influencers to post the discount code via their social media sites. If you have more budget, you can sponsor a Youtube vlog with your chosen influencer. 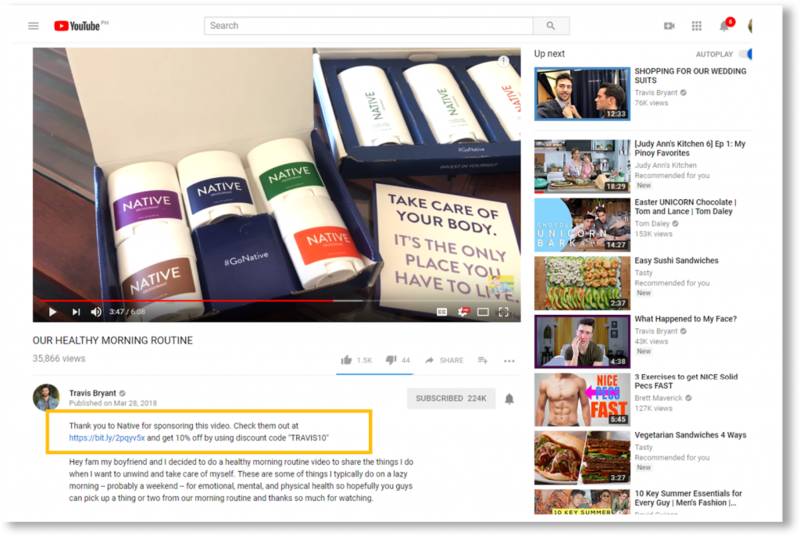 Usually you can get product placements and mentions on the sponsored vlog just like how Native sponsored this influencer to feature their products. The viewers get a unique promo code which they can use to purchase the featured products. This unique promo code also helps your online store to monitor and track the redemption rate. You will encounter one-time customers who will go inactive and dormant after their first purchase. For some online stores, they will just let that relationship left unattended. Instead of wasting that relationship, you can still reignite that connection by presenting re-engagement offers. For instance, you can use your online store’s app to send push notifications and app messaging to reach out to your inactive customers. 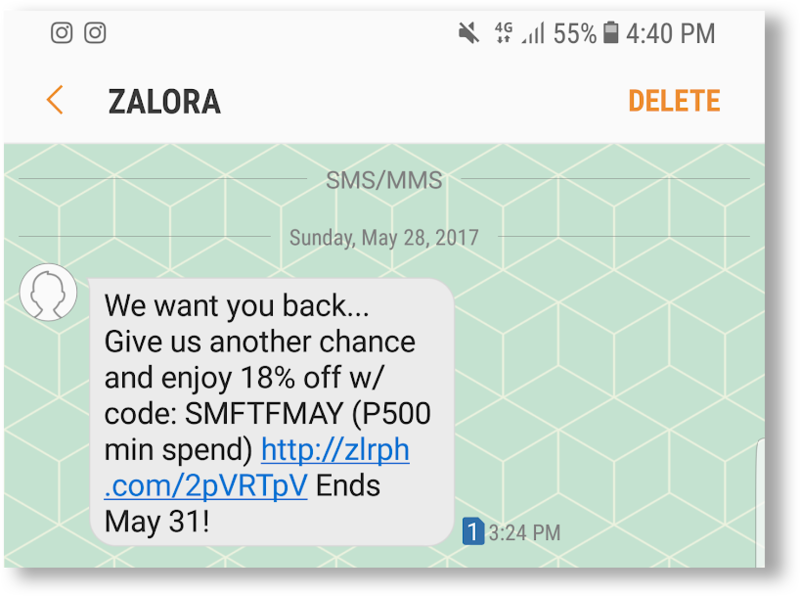 You can also use SMS to send an incentive to your list of inactive and dormant shoppers just like how Zalora sent an 18% off deal to its inactive customers. The average worldwide cart abandonment is 68%. This means that there’s an alarming number of customers who leave your store without completing a purchase. You can still recover that seemingly lost opportunity by reminding the customers to complete their purchase with an exciting offer or discount. Traditionally, popular eCommerce stores send out cart abandonment email as a reminder of the customer’s forgotten products without a discount or incentive. However, if you want a swift action from the shopper and drive the purchase, send a cart abandonment email including a tempting offer. 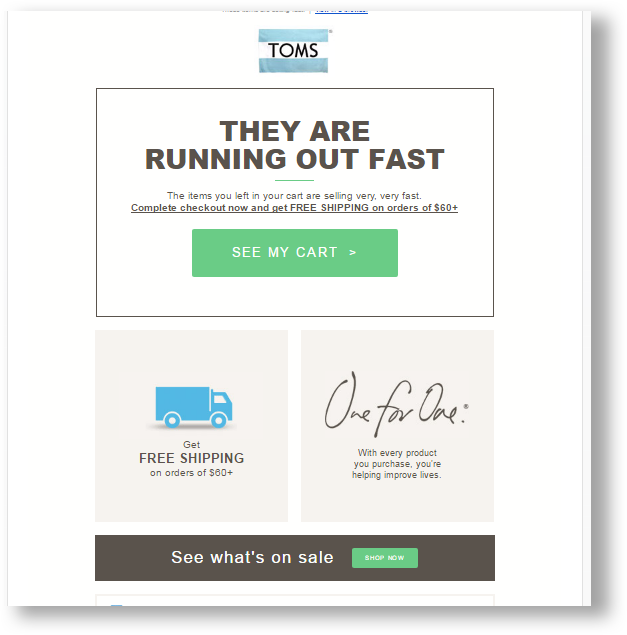 For example, Toms sends a cart abandonment email with an exclusive free shipping offer. Online shoppers are sometimes still undecided when they visit an online store. 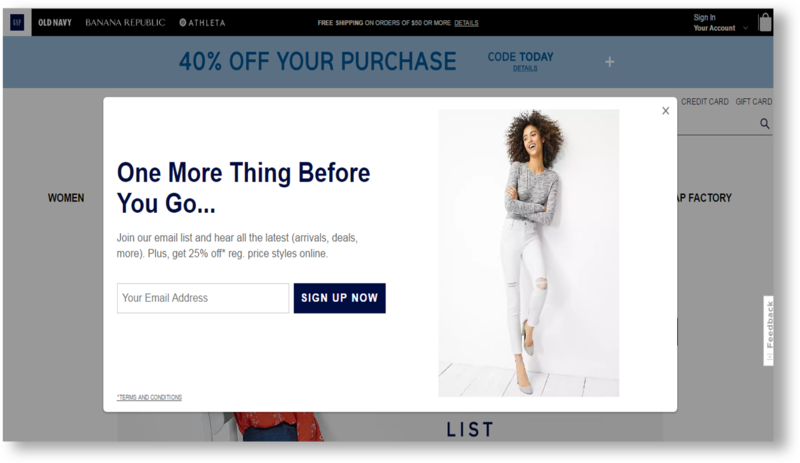 If you want to quicken their path to purchase, you can employ an exit-intent popup that will trigger when the shopper is about to leave your site. 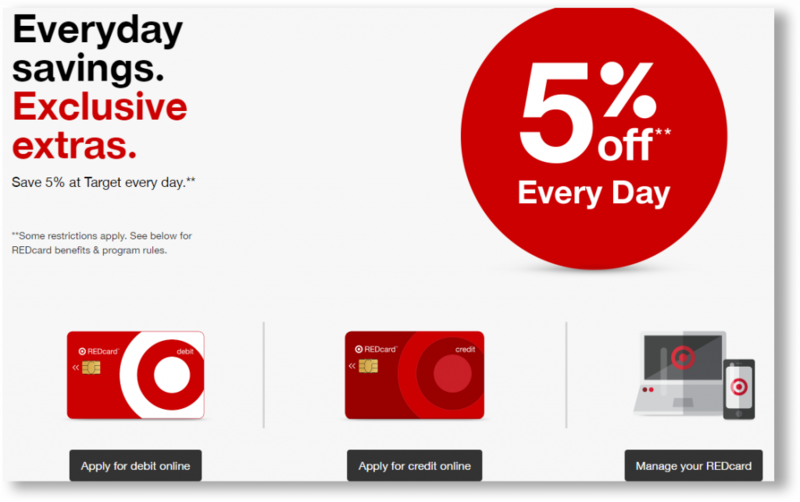 Make the exit intent popup more appealing by including irresistible deals and discounts. This exit intent offer is your last-second incentive to push your shopper to purchase. Gap has this exit intent offer in place so every time a customer leaves their site an 25% exit intent offer pops up. Important customer milestones and moments such as birthdays and anniversaries can also be an avenue for you to drive revenue and customer loyalty. If you want to make your shoppers feel extra special then you can leverage on celebrating their birthdays and anniversaries. For example, you can email them with a celebratory birthday email and then incorporate an exclusive birthday gift such as free product or an exclusive discount. 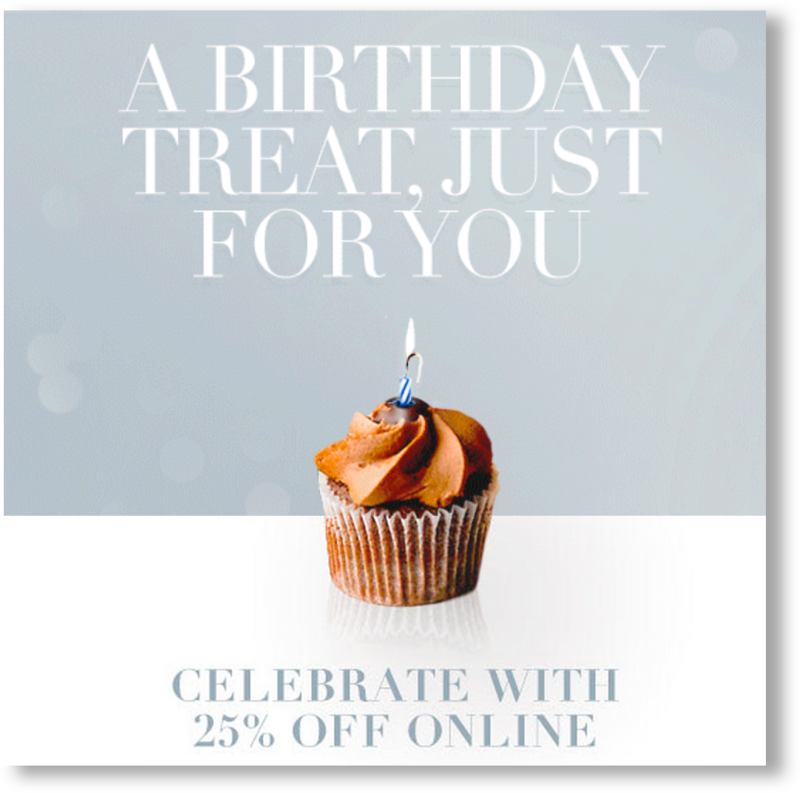 Steal this strategy from Marks and Spencer wherein they send a birthday greeting email to its shoppers accompanied by a 25% discount offer. A referral program is another way to reach more potential customers and drive your revenue. Also, one of the reasons why people remain loyal to a brand and begin referring it to their family and friends is because they want something in return. To have an effective referral program, your store should present referral offers or incentives to drive your shoppers on inviting their loved ones to check your site. A referral incentive can be given both to the person referring and the person being referred to. Sperry’s “Give $20, Get $20” is a groundbreaking idea that demonstrates how you can drive more revenue by incentivizing both existing customers and new shoppers with cash discounts. Feedback is an important way to gauge your customer’s experience. It’s also a way to tell your shoppers that their opinions matter to you. Customers trust and stay loyal to online stores that make them feel important. 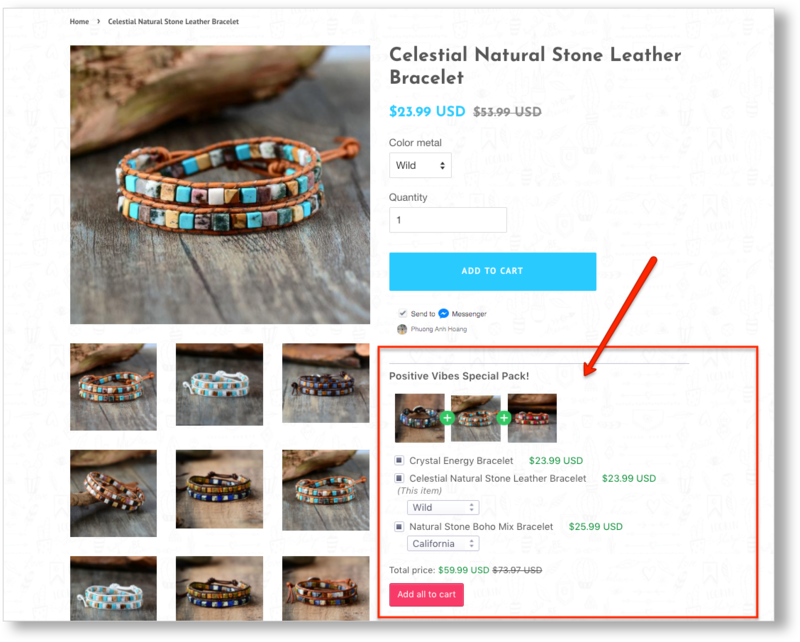 You can send an email asking for your customer’s feedback and at the same time, you can leverage this email to bring them back to your site and make a purchase. 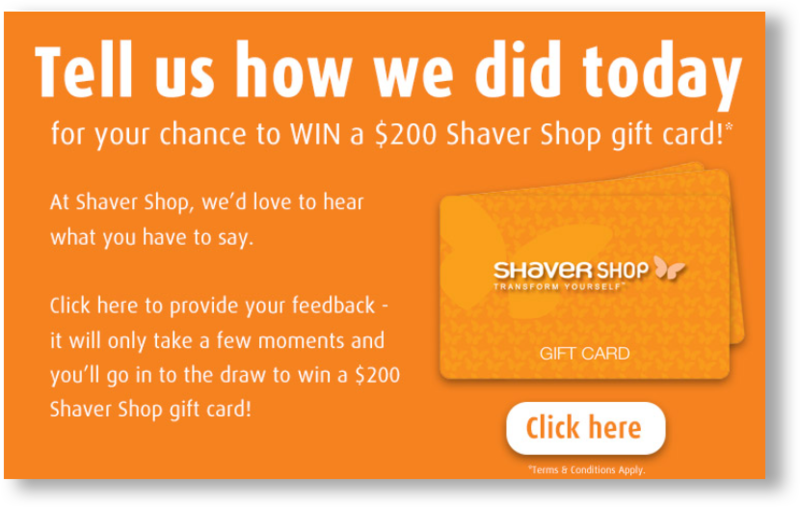 Motivate them by feedback offers such as coupon codes which they can use for their future purchase or a chance to win a raffle promo just like how Shaver Shop entices shoppers to leave a feedback in exchange for a chance to win $200 gift card. If you want to drive revenue and customer loyalty, using offers, coupons, discounts, and deals should ensure that creativity and value proposition are applied in order for them to be effective and stand out from competition. Customers begin their loyalty to online stores that provide a positive customer experience and a consistent excitement by providing the above examples of irresistible offers, coupons, discounts, and deals to accelerate sales and at the same time improve brand affinity. Impressive offer and deals, excellent ways, thanks for sharing with us.